Graduate trainee programme and Internships. Table 2 shows the average hours of training per employee, by gender and by employee category. All categories of employees were exposed to training. Relative to the 30:70 proportion of female to male employees, female employees received more training than male employees. In 2012/2013, over 13 thousand hours were spent in training and development for 644 employees yielding an average of 21.4 hours per employee trained. Table 2 Training Hours by occupational level, gender and per employee in 2012/2013. Professionally Qualified and Experienced Specialists and Mid-Management. Semi-Skilled and Discretionary Decision Making. Unskilled and Defined Decision Making. In 2012/2013 forty-seven (47) learners were in training, all of which have completed their level 4 (final level) of the programme. Electrical engineering and Instruments have completed and passed their trade test and are employed as Artisan Trainees. The Mechanical Engineering learners are to complete their trade tests at the end of July 2013 after which they will be absorbed as Artisan Trainees. Umgeni Water has offered bursaries to thirteen (13) students for tertiary enrolment in the fields of Civil Engineering, Mechanical Engineering and in Finance. During the year, four (4) students completed their studies in Civil Engineering on schedule and are currently absorbed as Graduate Engineers. Fifty (50) employees are on the Umgeni Water assisted education programme of which 45% are enrolled in programmes that are directly targeting critical and scarce skills for the organisation. Seven (7) graduates are enrolled in engineering, science and other required professional fields in the organisation. Umgeni Water’s graduate trainee programme is a two-year mentorship programme aligned to guidelines provided by professional registration bodies, such as, South African Council for Natural Scientific Professions in the case of scientists. Thirteen (13) students from the Institute of Higher Learning were recruited into the Work Integrated Learning Programme, which is a one-year mentorship programme that provides continuous integrated theoretical and practical learning experience. The students are exposed to learning in Laboratory / Analytical methods and Process Control. Students trained by Umgeni Water are generally successful in gaining employment within Umgeni Water or elsewhere in the sector after completing their development programmes. 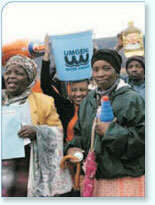 In addition, in partnership with National Treasury, Umgeni Water continued to implement the graduate development programme of engineers, technologists, process controllers and technicians with specific emphasis on meeting the skills shortages in the municipalities in KwaZulu-Natal and OR Tambo District Municipality in Eastern Cape. As part of this programme, forty four (44) trainees were enrolled for a period of five years. One hundred and thirty eight (138) employees from age fifty five (55) to sixty five (65) were exposed to pre-retirement training and counselling. This is undertaken annually, aligned to the expected number of retirees and assists employees with managing their retirement benefits. Organisational and employee memberships are shown in Table 10.5. These straddle governance and risk, water, science and engineering, natural resources and social impact management, business, finance and accounting, standards, occupational health and safety, amongst others. These help ensure the organisation keeps abreast in its core fields, participates in sector knowledge sharing and retains and enhances its core and distinctive competencies.